DEMONSTRATION in Net Ionic Equation, Classification of Reactions, Chemical Change, Solubility Rules. Last updated February 28, 2018. Wash hands thoroughly before leaving the lab. Fill a test tube ¼ of the way with 0.1 M potassium iodide. 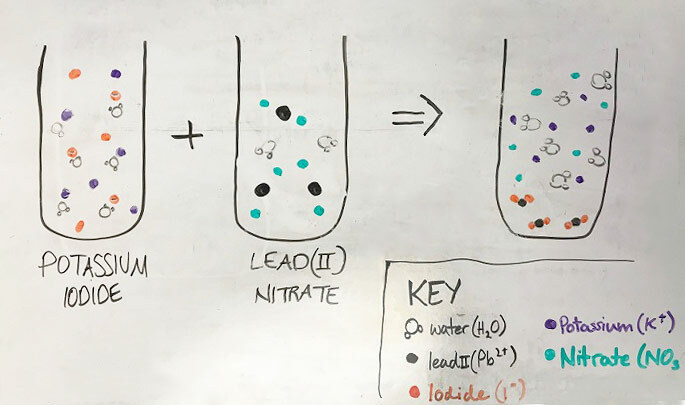 Add one drop of 0.1 M lead(II) nitrate. 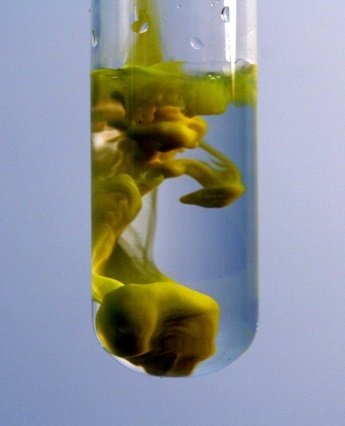 A bright yellow precipitate of lead(II) iodide forms immediately. Let it sit for the remainder of class so students can observe the solid settling to the bottom (some don’t think a solid has formed in the initial suspension). Performing the reaction in a test tube as a small-scale demonstration minimizes the amount of the lead-containing product to be disposed. It can definitely be scaled up to serve as quite a beautiful demonstration, you just have to filter and dispose of the lead(II) iodide appropriately. Before the solutions are mixed, I demonstrate that both reactants conduct electricity using a small conductivity tester. Then, in groups, students draw particle diagrams of each of the solutions on large white boards to review that each solution contains dissociated ions as evidenced by their conductive abilities. After I mix the solutions, I challenge the student groups to draw a particle diagram of the mixture, identify the yellow solid, and write a chemical reaction that shows the production of the solid. Students were introduced to basic solubility rules for ionic compounds in the previous unit, though I do not remind them of this at first. Are all ionic compounds soluble in water? How have we previously determined which are soluble and which are not? What possible ionic compounds could be produced from the species present in the solution? How do we know the formula of the solid is PbI2 instead of PbI or some other ratio of ions? What ions or molecules are present in the solution after the formation of the solid? After the discussion, I teach my students the general rules of writing net-ionic, complete ionic, and molecular reaction equations and we discuss the benefits and shortcomings of each. My students then do a practice worksheet where they practice the skills in writing equations and drawing particle diagrams that they learned. For a complete look in to how this lab fits in to the curriculum of the author, please refer to the associated article, published in the March 2018 issue of Chemistry Solutions. Find an accompanying article in the March 2018 issue of Chemistry Solutions.